There is one word that describes the Thursday version of the Alive Theatre's cherry-less Poppin' Play Festival at The Lafayette Ballroom. The word is sweeeeeeet. Sweet, but by no means saccharine: the Alive's approach, as evidenced by this their third festival, is hard-edged and challenging. Since it's a festival, it's not just about the plays (though it really is about the plays), it's about how there's art on the lobby walls that leads you into the performance space where the band du soir, Kettle Driver, warms up or else cools down the audience. In place of a hush of pregnant anticipation in the dark before the play begins it's about how, amidst the echoes of the just-finished music and the Cirque du Soleil-esque infiltration of the audience by some commedia dell'arte characters, and an atmosphere engineered by a mistress of ceremonies (Alive co-founder Danielle Dauphinee), the first of five plays seems to seamlessly emerge from the creative commotion, hubbub and buzz. If Long Beach theatres were cellphones, the Alive would be a Droid, the Garage an iPhone, and the Playhouse a Blackberry. It's a festival and that is what gives each piece its context. Five productions as varied as can be, incubated and then hatched in a party setting, world premieres one and all, each contributing to a sense that this is what live (heck, alive) theatre should be, spontaneous, relevant and, in their various ways, endearing. There's no beginning and no end to each story they tell, to its enactment. Only a sense of awe endures. The production can be nimble and clever, as Craig Abernathy's What Can We, directed by Steve Sornbutnark. It can update historical modes to great contemporary effect, as does Commedia dell'Arte on Love, a piece created in Italy. It can turn stereotypes on their head in Nicole Pandolfo's outrageous (make that outrageously outrageous) I Thought I Liked Girls, directed by Turner Munch. It can lay bare the chasm between word and feeling, as in the He/She drama Italy, by Steven Schutzman, directed by Dennis Hoffman. And it can turn an odyssey of self-discovery into a Godot-esque vaudeville act, as does Shots in The Dark, by Joseph Howells, directed by Carol Anne Perini. There's no overarching control imposed on these productions.There couldn't and, wisely, shouldn't be, with five original, different works and five different directors. Thematically the works might coalesce, as they do on Saturday's four shows. But what holds these -- and the rest -- of them together is the sanctuary of the space. More than anything else the Lafayette's Ballroom, band noise and cigarette smoke bans notwithstanding, serves as a theatrical safe house, a place to experiment freely, a site where pieces that might not otherwise be produced for reasons of content (Ms. Dauphinee told how one venue was nixed because of the storyline of I Thought I Liked Girls), budget, and opportunity see the light of day or else the moonbeam of night. Not here, thank goodness, not here. In many respects, the Friday evening segment of the Alive Theatre's Poppin' Play Festival at the Lafayette Ballroom is the best of the three (the other two being Thursday and Saturday), unless you've seen the other two and, agog from this or that evening, then those evenings would the best. And so it goes, Festival-wise: each evening offers productions of interest, stories that reverberate. Each one sticks with you, gets you thinking about what you've just seen, how it relates to you, to the world and, most important, how you relate to the world. You marvel "Live theatre can do all that?" Similarly, one could submit that this third PPF was the best of the prior two, unless, of course, you've seen them as well. In terms of speed, decision, and radiance, the productions were forceful. What Can We was lapidary, What King Kong Dreamt was an amazing assemblage of spectacle and noise, Elephant worked wonders with a metaphor, and Jinx did the same with a child's game. As inorganic as they may have seemed together, each production did elucidate and entertain. This evening's iteration of Craig Abernathy's What We Can, directed by Turner Munch, came across as a brainstorming session: ideas tossed out, elaborated upon, and/or dismissed. Performed by Dave Honigman, Nicole Stedman, and Jared Crossman, some scenes occurred behind a screen, giving it both the look (and duration -- five minutes) of a puppet show as well as the meta-feel of a play about the scripting of a play, which in turn dovetailed nicely into a metaphor for scripting, directing, and starring in what is the most unique production of all: one's life. Jinxed, by Alexa K. Mavronatis, directed by Dion Chang, melded a post-apocalypse landscape with the children's game, Jinx. The post-apocalyptic part was apparent enough on that minimal stage. Would such a thing happen, it would come as a shock but certainly not -- with potential threats biological, chemical, and nuclear -- as a surprise. What gives the production resonance is that it occurs between two people, Meatloat (Fayna Sanchez) and Stringbean (Amir Levi) who, as it happens, are the last two people on Earth. It's not about the odds that they'll survive hunger, desolation and hopelessness, it's about the odds that they'll say the same thing at the same time, Jinx each other, and carry on from there. Both sublime and ridiculous the production does, in a quirky, effective way, offer one viable solution to one viable catastrophe. And last but certainly not least, there's What King Kong Dreamt. Like Elephant, it features the thoughts and feelings of an animal. Referencing both Shakespeare and William Faulkner ("A tale/ Told by an idiot [or a gorilla], full of sound and fury, Signifying nothing.") it's easy to see why this came last on the evening's playlist: disassembling the audience as it does, it would be difficult to follow this up with anything else. Directed by Jasper Oliver, the piece was written by six people and enacted by 17. It features a seamless stream of conscious blur of noise, light, song, dance, and movement. A speculation on what King Kong could conceivably have dreamed, this oneiric odyssey streams images that presumably could have simmered in this simian's subconscious. It's not something to ponder, it's something to experience. To set the stage, a Salvador Dali-esque two-legged Clock pirouettes around the stage, suggesting liquid dream-time. What follows is, well, dreamy. The clamorous birth pangs of a pineapple. Drunk penguin-esque figures that suggest American imperialists. A rhino taking a glittered leak. A downpour of bananas. A murder and subsequent funeral scene, attended by a nun (Eat your heart out, Luis Bunel). A jam session that's a cross between a Hari Krishna celebration and a Brazilian Carnival. An alligator jig that becomes a Eurovision dance party. And a fleeting reference to Fay Wray. It's refreshing, in a synapse-searing way and, as curiously entertaining as it was to experience it in person, God would I love to have seen the script. The four productions that comprise the Saturday portion (there's a Thursday and a Friday playlist as well), of The Alive Theatre's Poppin' Play Festival are not the stuff of community playhouses with a chiseled demographic or theatre companies with large spaces. Nor do they invite lavish stagecraft. They are for young companies like the Alive with a lot of energy, a willingness to take chances, and an assumption that the audience doesn't just want to be entertained, they want to be challenged and stimulated. Since the Alive chose these pieces, produced them, gave them their premieres, it makes sense that the evening felt tight and integrated, homegrown and organic. The productions were four in number. They included What Can We Be, by Craig Abernethy, directed by Jeremy Aluma. Jumper's with the Gypsy, by Nathaniel Kressen, directed by Roger Q. Mason. An Agreement Between Father and Son, by Lloyd Noonan, directed by Jerry James. And Eddie: A Musical About Failure, written and directed by Robert Edward. The productions poked and probed at boundaries of what-is and what-could-be. Two were short pieces, sketches, really. The other two were more elaborate. Two were frenetic, past-paced, two were a little more reflective. One was a musical, with music provided by The Eddie Band: Ellen Warkentine, Roland Cruces, Ricky Cruces, and Thomas Amerman. The staging was minimal; it had to be, given the constraints of The Lafayette Ballroom. It was a little uncomfortable, until they opened the front door at the break to let in cool, fresh air. The acoustics were so-so, especially during the musical. It felt more like everything was taking place in a tent or under an awning, which gave the evening more a feel of street theatre that, I think, was precisely the point. Besides whatever impressions you took home that evening, what you see when you watch these four productions is the ongoing forging of a theatrical identity. Each of the four pieces was about playing with potential and then finding and acting a role. What We Can is a fast-paced recital of the limitless things the actors (Johnny Arena, Brent Fleisher, Raymond Lee, and Kat Primeau) can do in the space of five minutes. (It's enacted each night of the Festival, with a different director and, presumably, a different emphasis). They can steal a drink, love, fight, duel, or perform a ballet. A great way to begin the evening, it comes across as "The Love Song of J. Alfred Prufrock" on Red Bull. Jumper's with the Gypsy is about two young people who go out on a first, a second, and a third date. But they're acting: they're playing with a role. It's a dare, it's a business transaction. It's edgy and it's profound. An Agreement Between Father and Son describes the unintended consequences of what happens when a Father (Andrew Eiden) and his Son (Joe Howells) assume roles to deal with a cranky, retirement-homed Grandfather (Ryan McClary). The roles? Rebellious Son, Dutiful Father, Doesn't-Give-a-Damn Grandfather. And Eddie: A Musical About Failure is a story of how nature abhors a vacuum. A new guy on the supermarket crew, Eddie (Robert Edward), is a loner. By virtue of his silence, his colleagues fantasize via song about his identity. By comparing themselves to Eddie's nothing, which default is perfection, they themselves are nothing. The acting in all these pieces felt natural, it felt improvised, and it felt genuine. The themes pounded home weren't monumental, they were provisional and, given the audience, relevant. Each of the four stories honed in on how, for better or worse, we are the playwright, director, and star of our own scripts. As such, we're responsible for their production. What matters is how we play them. Not a bad theme, not a bad theme, at all. Performances are 8pm, Thurs. -- Sat. 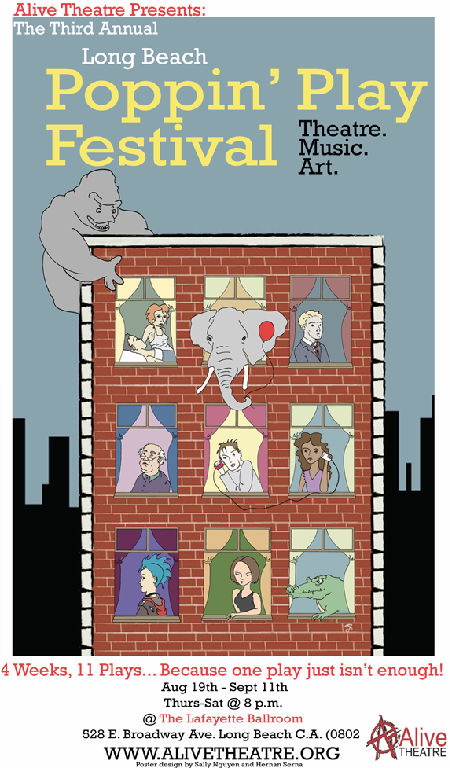 The Festival runs until Sept. 11. Tickets are $15-18. The Ballroom is located at 528 E. Broadway Ave. For more info call 818-7364 or visit http://www.alivetheatre.org.